Walla Walla Friends of Acoustic Music & Whitman Social Dance Club invites you to join them for First Wednesday Contra Dance! 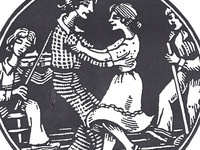 The First Wednesday Contra Dance at Whitman College's Reid Center Young Ballroom takes place from 7-9 pm, no admission charge, featuring live music by Frog Hollow & Friends and local callers. Open to the public as usual; come join the fun!